My experiment with @radareorg and #angrdbg is working now, very naive but usable. The state transfer from the debugger to angr is fine but i must improve the memory loading (p6e for every byte is not a good idea). Use angr inside the radare2 debugger. Create an angr state from the current debugger state. Vesion 1.1 of Cutter, the GUI for Radare2 formerly known as Iaito, has been released. Click on the second tweet below for an animation of the GUI in action. Smooth disassembly graph navigation – now in @r2gui! Let's use radare2 to reverse engineer a Gameboy ROM! There’s a new GUI for Radare that looks pretty nice. The Praetorian security blog has a very detailed and well-written blog post of a MIPS-based system, showing/discussing multiple tools (BowCaster, QIRA, BinWalk, Radare, …). And there is a Part 2 in the works! Windows driver signing bypass by Derusbi has a post on Sekoia.Fr analyzing the Derusbi malware and it’s code signing bypass. Detailed analysis. There was a Radare2 workshop at HACK.LU 2015, which included firmware targets. Check out the github’s top-level readme, Chapter 2 on Firmware. There are some UEFI-based demos in the Github project, as well. EBC, The EFI Byte Code, is a UEFI feature that supports Intel (Itanium, x86, and x64) instructions in a single bytecode. The Intel C Compiler can target EBC, and UEFI drivers can use EBC instead of native drivers, to save space (1 binary, instead of 3). The other week I gave a firmware security tools talk at BlackLodgeResearch.org, and Vincent Zimmer of Intel showed up. I had a slide complaining that EBC is only supported by Intel C Compiler, a commercial-only product, and that the UEFI Forum should fund a ‘summer-of-code’-style effort to get EBC into GCC or LLVM CLang. After the talk, Vincent mentioned that ICC had to do a bit of unexpected work to generate EBC, and would blog about it. Well, he did blog about it, a few days ago, just catching up to it, and describe the problem. If you know of someone on the LLVM CLang or GCC project, please try to add a request for EBC support. Not only would it be nice to have LLVM CLang work with EBC to have an alternative to ICC, and for LLBVM’s Klee fuzzer (to fuzz UEFI via OVMF), but ALSO because the Capstone Framework RE tool uses LLVM’s intermediate form and would then get EBC support!! Today, radare2, another RE tool, already has EBC support. Also, there’s a C#/IL to EBC translation project on Github. If you get it to work, let me know! 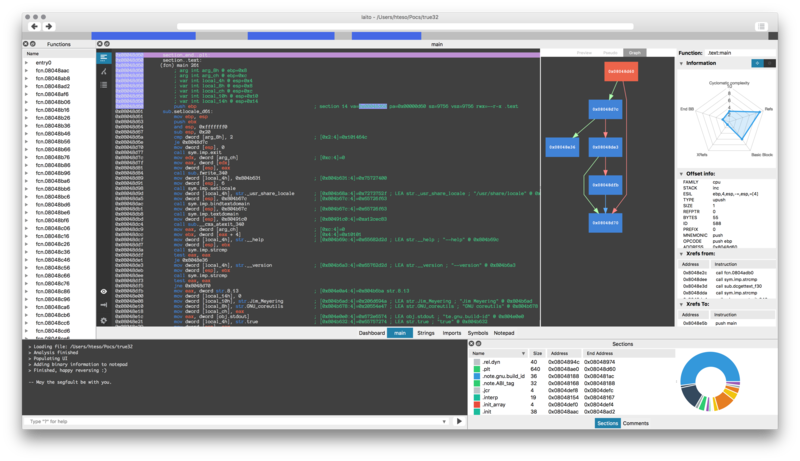 Radare is an open source reverse engineering tool, it has GUI and command line interfaces. It is peer of IDA, disassembling code is the main focus. It supports many architectures: 6502, 8051, CRIS, H8/300, LH5801, T8200, arc, arm, avr, bf, blackfin, csr, dalvik, dcpu16, gameboy, i386, i4004, i8080, m68k, malbolge, mips, mips, msil, nios II, powerpc, rar, sh, snes, sparc, tms320 (c54x c55x c55+), V810, x86-64, and zimg. It supports many file formats: bios, dex, elf, elf64, filesystem, java, fatmach0, mach0, mach0-64, MZ, PE, PE+, TE, COFF, plan9, bios, dyldcache, Gameboy and Nintendo DS ROMs. It supports many operating systems: Android, GNU/Linux, [Net|Free|Open]BSD, iOS, OSX, QNX, w32, w64, Solaris, Haiku, and FirefoxOS. It has multiple language bindings: Vala/Genie, Python (2, 3), NodeJS, LUA, Go, Perl, Guile, php5, newlisp, Ruby, Java, and OCAML. Radare’s GUIs aside, the r2 command line UI offers nice use of colors and graphics to correlate assembly language features, somewhat like how Scapy does with network packets. Best yet: radare supports EFI Bytecode (EBC)!! They added EBC support, started about 2 years ago. Search for TARGET_EBC in the code. They don’t list EBC in their architecture list (above), so I’ve yet to see how well it works. Note also in above list, they support TE executable images, and some level of “BIOS” support (yet to determine what that means).